Whether you’re looking for one, two, or three bedroom apartments, Verano Apartments offers the space and thoughtful design you need to feel right at home. Individuals looking to spread out will feel well taken care of in one of our one bedroom units. If you’re a couple planning an addition to the family or a host for friends from out of town, choose a two bedroom unit and decide whether you’d also like the added comfort of a second bathroom. 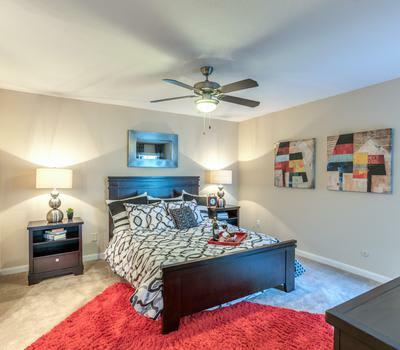 Three bedrooms can easily accommodate a growing family with room for a home office or playroom. No matter the size, our apartments’ airy open floor plans can easily fit to your lifestyle – not the other way around. Every apartment for rent at Verano Apartments comes equipped with features you’ll love. Walk-in closets and new black appliances make tidying up less of a chore so you can spend more time doing the things you enjoy. Choose a layout that includes a fireplace and wood-style furniture for endless evenings of rustic elegance. Learn more about how Verano Apartments can offer you the apartment you’ve been searching for. Contact us today to plan your visit.